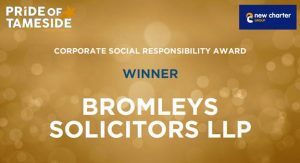 As part of our corporate social responsibility, we regularly seek to engage with the local communities through a range of activities which include charitable causes, campaign support and free presentations, through to our free weekly legal surgeries, event sponsorships and memberships. 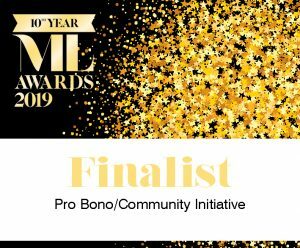 We have recently been shortlisted for the Manchester Legal Awards in Private Client Team of the Year and Pro Bono/Community Initiative Award. 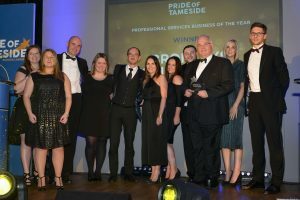 In October 2018 Bromleys Solicitors LLP were awarded the ‘Professional Services Business of the Year’ accolade at the prestigious Pride of Tameside Business Awards which is a celebration of outstanding businesses across the borough. 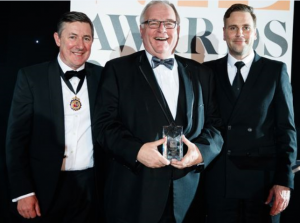 We also won Small Law Firm of the Year 1-5 Partners Nationally (2018) at the Manchester Legal Awards on Thursday 1st March 2018. 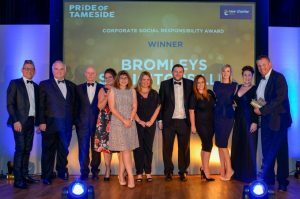 On 2nd November 2017, we received the Corporate Social Responsibility Award at the Pride of Tameside Awards. This award recognises our commitment to the wider community and we are delighted to have received such an accolade. 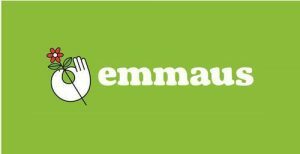 Each year, our staff nominate and vote for their favourite charity and our 2019 chosen charity is Emmaus – Which is a charity throughout the UK working to end homelessness. We will be sponsors for The Community Action Nepal fundraising Lecture in November 2018. For more information please visit CAN Lectures. In August 2017 we became the official home sport sponsors for Curzon Ashton Football Club which is heavily involved in the community through a variety of footballing initiatives and runs more than 40 teams for boys, girls, men and women. Every cause will be considered by the committee and supported where possible. We cannot guarantee that ever cause brought to our attention will become one of our chosen charities.